On this day, 47 years ago, William Michael Griffin, Jr. was born. Today, he is better known as Rakim Allah, The R, The God MC, or simply, God. It's a fitting title, because not only is he the most dominant MC of all time, but it's from his style that all others since have stemmed. Today, we celebrate Rakim's birthday with the gift of 70 songs, as originally compiled by the Rap Dungeon. Whereas yesterday's compilation was basically a lost album, this one is nothing like that. It's three folders of random collaborations and non-album cuts. 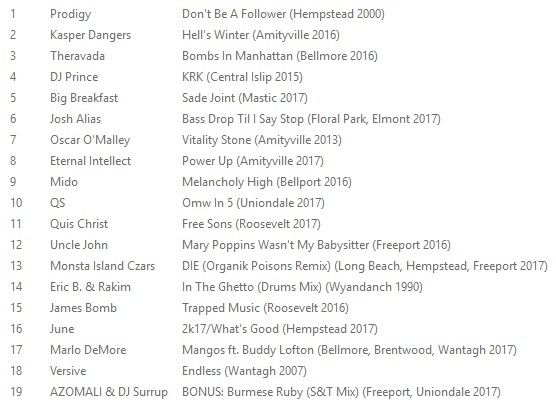 And for the Long Island hip-hop completist, it's indispensable. #2 & #3 have the same link...thanks in advance for fixing it and also props for sharing these gems!!! Should be good now. Thanks for the heads up and for listening. Enjoy!